...what the heck happened? In 6.x it is so simple: Textures and decals. Apply global textures to an object with texture mapping, and then to individual faces with decals. I could---and did frequently---apply multiple decals to a face. I design point-of-purchase displays for a living so I use the heck out of this feature. Where is the decal tool in 8.6.2? Please tell me they didn't do away with it. If the new version doesn't have a comparable function, it will be borderline unusable for me. And please don't tell me to create a separate object, apply the texture to that and group it. I want to be able to create a piece of translucent acrylic, for instance, and apply 3 different brand logos, screen-printed, on it. One object. In 6.x this is easy as cake. Sorry for the rant. It just seems like they took something that was "fixed" and broke it for no reason. Thanks for any and all help. The entire "decal map" thing needs to go away. We should be able to apply any map in the same workspace, and see it real time without the need to render it. FZ also needs to support Photoshop layers. Decals are really just a workaround for proper modeling and mapping. They don't work in OpenGL based Shaded modes, nor VRAY, nor any other rendering engine but RenderZone. If you're happy with the old school results of RenderZone, feel free to keep using them. You can customize your main workspace to add these tools and any others using the Tool Manager under Workspace>Tool Manager, without having to ever switch workspaces again (I never have to anymore). I agree, the workspaces UI concept should be abandoned for a more modern UI. I agree that being able to see decals in Shaded Mode would be wonderful. But the lack of ability to see them in any mode but RenderZone shouldn't be cause to do away with the function entirely. Why not just FIX the issue so they can be previewed in those modes? Don't throw the baby out with the bathwater, STS. I'm perfectly satisfied with RenderZone's rendering quality, otherwise I wouldn't have purchased the whole package... 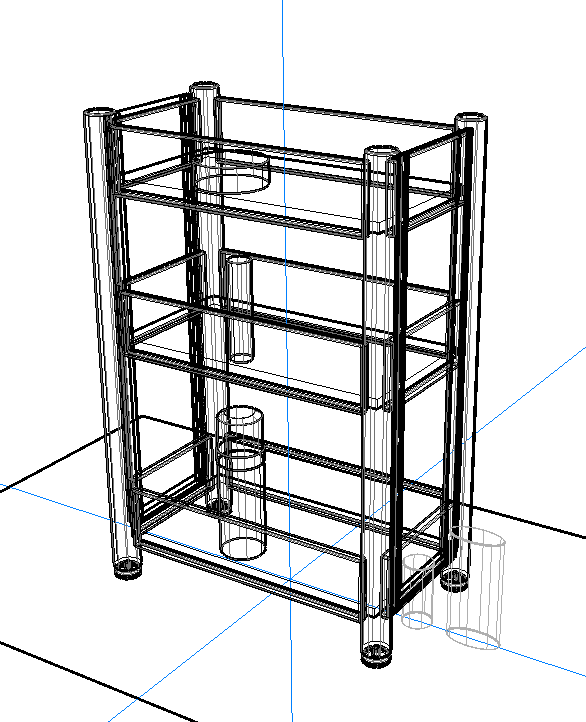 I work in the POP display industry, and I don't have the luxury to let VRay or Keyshot sit and churn for 30 minutes. RenderZone powers through exactly what I need in less than half the time. If, as you say, "Decals are really just a workaround for proper modeling and mapping," how would you map the attached WITHOUT decals? Packaging labels on clear water bottles, screen printed translucent panels, etc. Thanks for the tip about Tool Manager also! I moved all my rendering tools over to the main workspace. Appreciated! I like the way C4D handles "decals"... you are simply able to have textures overlap each other. The "non-decal" is tiled, the "decal" doesn't tile and you can adjust it on your object accordingly. This would be a welcomed addition to formZ. I agree that Decals could have much better usefulness if they were also rendered in Shaded view and VRay. FormZ = Flexibility. There's often more than one way to do what you want with the power and flexibility of FormZ. First, you create your new logo Material with the appropriate logo file (Tiff or PNG), and set it's transparency to use the same image file's Alpha channel (If the logo doesn't have an Alpha Channel, go into Photoshop and create it.) Now you have a material with the logo cutout. FormZ logo example attached. Then, make a plane geometry on top of your bottle surface, or wrapping the bottle like in this example. Keep the plane just from touching the bottle, .01 tends work easy for keying this in quickly. Now turn OFF shadow casting on your new wrapper. Apply your logo with alpha channel transparency material to the new wrapper. Adjust mapping as appropriate. This is just a quick and dirty example, but you should be able to get something like this. I'm using VRay with my 16 core AMD 1950x CPU, This rendered in exactly 1 minute (time limit set in Vray). That's plenty fast in my experience, so if you are only avoiding VRay because of the speed, you should reconsider if you have a modern workstation computer. It's even faster with GPUs, but I turned those off for the simplicity of this example. You should be able to use the same technique with RenderZone. I create transparency maps using the image's alpha channel all the time. 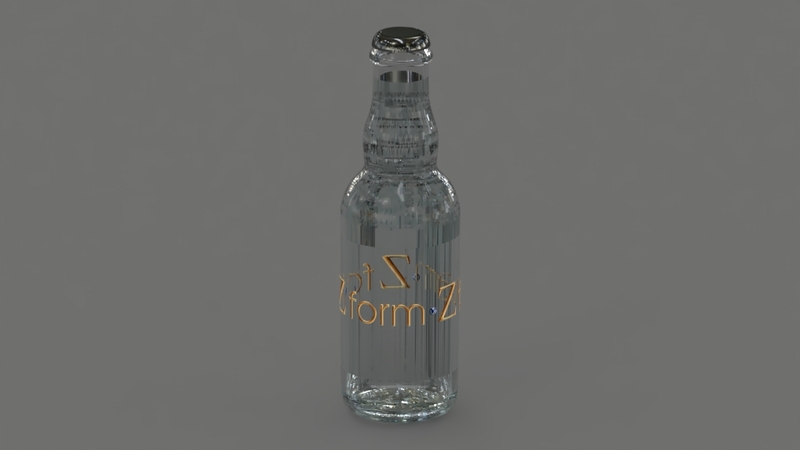 In fact it's how I created the bottle labels in the file I attached above... Make the image the same height and width as a front view of the bottle and the label will be perfectly positioned once mapped to the dims of the bottle in formZ. - Every time you want to move the bottle, you now have to move 2 objects instead of 1. When using the Join tool so that objects can be moved together, properties like texture mapping and shadow casting get funky, in my experience. - formZ often can't handle offsetting from a complex surface. A simple bottle is usually OK, but what about a logo on a curved baseball cap? Or a label on a whiskey bottle? Etching on a wine glass? Regarding VRay, as mentioned above, I've been satisfied with my RenderZone speed and quality so I haven't really felt the need to upgrade in that department... If it ain't broke, don't fix it. I'm using a 2011 17" MacBook Pro. I don't know the processor specs off the top of my head, but it's maxxed out and does just fine. Ctrl+G groups objects together without messing with their texture mapping or shadow casting. Command+G for Apple is the default shortcut I believe. Mapping in C4D is a breeze. I also like it's sub-d modeling tools. Unfortunately, in my current position I am not allowed to use it. I've noticed that 8.6 moves grouped objects together by default (6.5 doesn't unless you have the "Group" topological level selected). May have to take advantage of this. One of my coworkers uses C4D; seems like a nice program. I do like the ability to choose whether texture maps OR decals are tiled, though. Hi again guys. Thanks again for all your help. Texture mapping is going pretty well. Getting used to it. 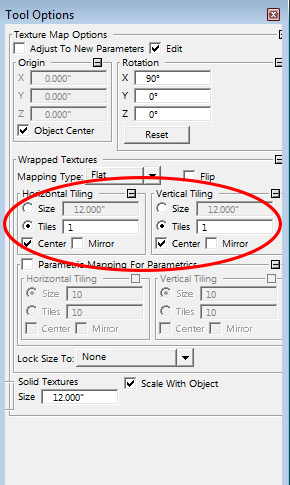 One question at the moment: When using flat mapping in 6.5 it was possible to set the texture map to automatically size itself to 1 tile across by 1 tile high on an object (see attached image). Is this possible with 8.6.2? If so, how? Yeah I don't get it. It was super handy, especially when mapping product. 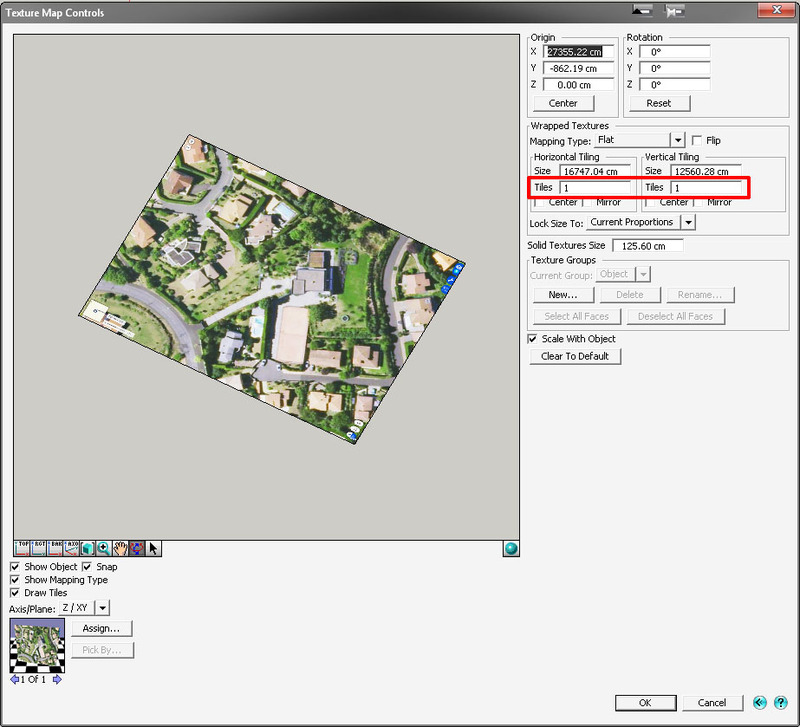 I could create the map in Photoshop, import it into formZ and just set it to tile 1:1 on the object. Done. Now I have to visually guess if my texture map really fits over the whole object... Annoying. I'm not sure I understand exactly what you're doing. For my part, I use it for the mapping of terrain with captured aerial photo on the site of our national service of geography. It is enough that I know the size (in pixel for example) of my image, I create a corresponding rectangle, then I scale it then I use Get / Set attribute to project on the final mesh. 2- did you understand how you can adjust the copied parameters BEFORE assigning them? in other words, can we modify the "attributes" before assigning them? In other words, how can we assign several attributes temporarily stored in a list (which is very good "GET" attribute in Z673) including the parameters of mapping in one go on several objects or only one of the choice and renew this operation as many time as needed keeping the same setting or modifying some? it's like in form 8: simpler! No the maps I create in Photoshop don't have to have exactly the proportions as the object I'm mapping onto. That was the beauty of the 1:1 tile option on the Texture Mapping menu. Really hope that functionality is still present. Maybe it's just buried somewhere new? Yes... the forums are messed up, pop up images seemed to be blocked, or not working... Tech are you seeing this? I agree that the old detailed mapping was really nice, and it will hopefully be brought back in some sort in the future. That said, the new Shaded interactive mapping is really fast once you get the hang of it. Make sure you only have Point Snap turned ON, then simply drag the corners to snap a 1:1 on the object. Is it as fast as the old way? Probably not quite, but I actually really like this new Interactive way of mapping since it allows you to visualize changes to the mapping incase you find 1:1 isn't as ideal as you thought. Thanks Justin! I will try that when I get home and dig into my after-hours freelance workload. on the other hand I do not really see where this option would have hidden! Hi all. Coming along with 8.6... Lots of things I miss from 6.5 but I'm getting used to it. I've made the transition fully with my home MacBook Pro I use for freelance, but now I'm finally setting up my work PC with 8.6. Current issue is that Shaded Work and Shaded Full display as wireframe.....which is going to be make texture mapping pretty difficult, lol. Any solutions? Thanks again for any and all help! Thanks for the reply. I'm sorry I didn't reply sooner---for some reason I didn't have the subscription turned on for this thread.